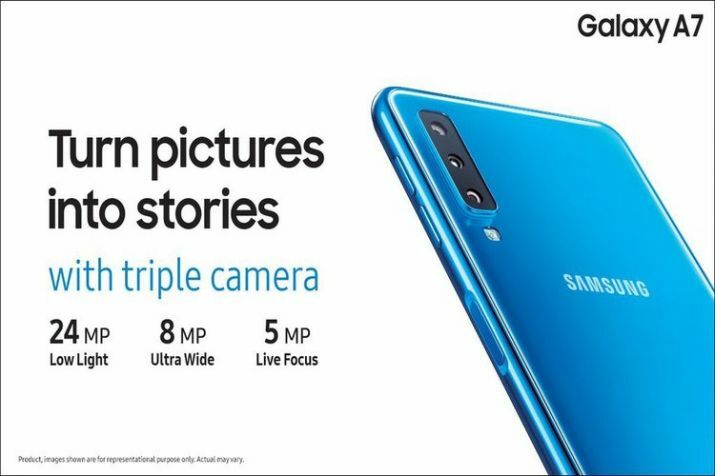 Samsung Electronics is all set to debut its first triple rear camera smartphone in India. The Korean tech giant once again took its dominance in all types of mid-range of the Android smartphone market. After revealing all the midrange smartphone Samsung Galaxy J4, J7 the company came up with its new mid-range smartphone which will offer features which are hard to find in this category of smartphones. The company has stated that the Galaxy A7 would be made available in select Asian and European markets ‘starting’ this fall. As promised, the company made new Galaxy A-series available in India. The new Samsung Galaxy A7 is going to be available exclusively on the e-commerce platform Flipkart. Here are the entire specifications of the smartphone. Samsung Galaxy A7 will be going to be available in India starting today. Samsung Galaxy A7 has been priced at EUR 350 which is going to be roughly Rs 30,000 in Indian currency. The Dual SIM smartphone is going to work on the Android Oreo 6.0 out of the box and bears a display of 6-inch full High Definition+ (2220 x 1080 pixels) Super AMOLED Infinity with an aspect ratio of 18.5:9. The smartphone is going to be powered and supported by an octa-core SoC clocked at 2.2GHz and is going to be paired with either 4GB or 6GB of RAM. When it comes to the storage, the Galaxy A7 comes in two memory configurations namely 64GB and 128GB which can be extended further up to 512GB via microSD card. On the optics department, this is the first smartphone from the company which is going to have a triple camera set up at the back of the smartphone. The smartphone packs three lenses comprising of a 24MP primary sensor with an aperture of f/1.7 aperture, an 8MP ultra wide sensor with f/2.4 aperture, and a 5MP sensor for depth effect. On the selfie part, it has a 24MP fixed focus camera sensor with f/2.0 aperture and LED flash. The smartphone is fueled by a battery of 3,300mAh which is a non-removable one which also comes with support for the fast charging. On the connectivity part, the smartphone has 4G VoLTE, dual-band Wi-Fi 802.11ac, Bluetooth version 5.0, ANT+, GPS, GLONASS, and a 3.5mm headphone jack. Some of the sensors onboard include an accelerometer, gyroscope, proximity sensor, and RGB light sensor. Pingback: Oppo’s New Find X Would be the first 10GB RAM smartphone?